Award-winning Vendela Vida’s latest novel, a comical-fantastical tale of lost identity and impersonation, is set in present-day Casablanca. The unnamed central character, referred to as ‘You’, has left her husband and travelled here from Miami. Upon arrival, even as she is checking in at her hotel, she loses her backpack containing her passport, credit cards, money, camera and computer. Farcically unhelpful police procedure leads her into accepting another woman’s backpack and ID. From here on, she gets in ever deeper, assuming new identities whenever she is about to be cornered. She is 33, hypersensitive about her scarred complexion, and a deep-sea diver by choice (people can’t see your face). When she is invited by an on-location film director to replace the leading lady’s sacked stand-in, she can’t believe her luck: this is work paid in cash, with nothing to do except wear a wig and look (at a distance) like a film star. When the film star asks her to stand in for her in real life, to take her place and go out for dinner with an infatuated Russian businessman, life begins to get complicated. On the morning after the night before, her brain ‘feels like it has just been broken into seven continents’. Paparazzi have photographed her falling-down-drunk. She has to get out. Almost incredibly, she wriggles out of all her current identities and makes a dash for it. 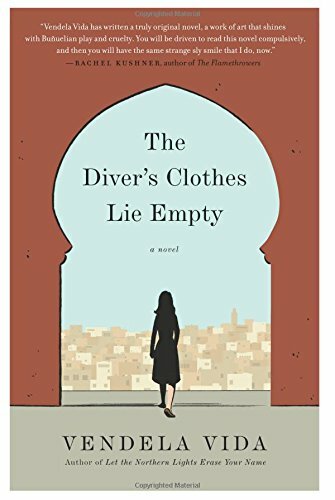 Immediately riveting, and outrageously funny, The Diver’s Clothes Lie Empty takes a nightmare scenario and gives it everything she’s got.